We make our Heavy-duty Trellis from pre-treated 19 mm x 38 mm battens, each nailed at every intersection, making it easily one of the strongest trellis available anywhere. 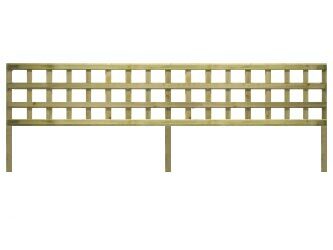 Can be used as a panel or for special features in pergolas as well as wall and deck screening. Ideally suited for use with an existing fence or brick wall where the extended battens can be used for fixings.